As soon as I buy apples and start daydreaming about my favorite fall confections- imagining clear, cool evenings and Eva Cassidy’s haunting rendition of Autumn Leaves – September turns sultry and humid, reeling me back into the closet to peel off my boyfriend jeans and fresh new flannel shirt. Faster than Gordon Ramsay can mock sashimi Yours Truly is grabbing faded summer shorts and my favorite BOSTON t-shirt to bake barefoot. 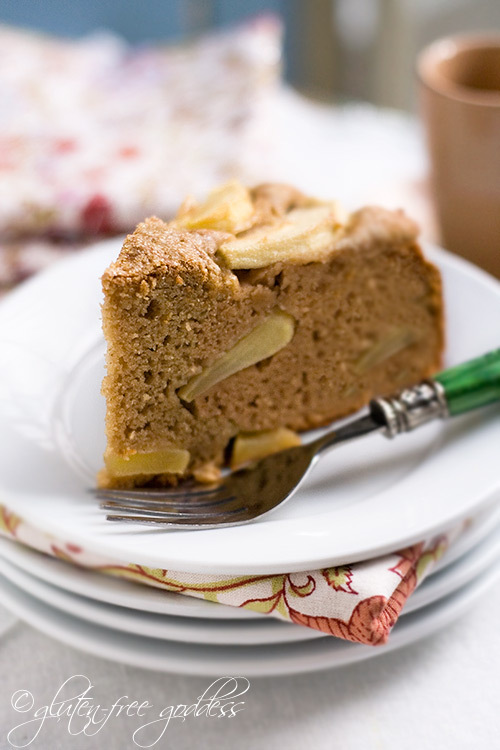 Enjoy this new apple cake recipe. Share a slice or two amongst yourselves. Don’t worry about me here in my hot little apartment. Have some cake. You’ll love it.